How does anyone even think of this stuff? 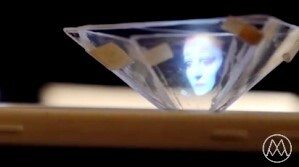 This video demonstrating how to turn your smartphone into a holographic projector was posted by Mrwhosetheboss on August 1, 2015 and has over 10 million views already - and it's no wonder. He doesn't mention on the video what inspired the idea. A clear plastic CD jewel case cover it used to make the projection surface and specially created videos that project onto the four faces are used to create the holographic effect. The concept reminds of a little multi-faceted mirrored device that used to be sold which sat in the middle of a record player and turned flip-book type still images printed on the album into a simple video. My cousin had one. A little research just now turned up the Red Raven Magic Mirror (videos on website) from Morgan Development Laboratories. The records ran at 78 rpm, which was probably necessary in order to avoid the flicker that would likely be noticeable at 45 rpm or 33-1/3 rpm. 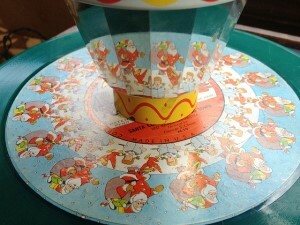 As with most things these days, you can buy a Red Rave Magic Wheel and records on eBay.